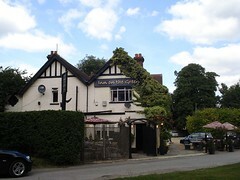 Pub near Tadworth, incorporating a restaurant known as "The Grumpy Mole". Entry is into the bar area, with three distinct restaurant areas further back; two small and cosy, and one larger and lighter. There's also a patio to the side which can seat around 40 people, and more outdoor seating at the front of the pub, sheltered by trees from the busy Dorking Road. According to a sign seen in August 2013, the patio at least is non-smoking. It's more restaurant than pub, with just five small tables seating 12-15 people in the bar area and the rest of the space given over to dining. However, it has handpumps for real ale, which on our August 2013 visit were clipped for London Pride and Harvey's Sussex Best; they also had keg offerings including Symonds Founders Reserve cider. elvum visited in December 2008 for a pre-booked Christmas lunch from a set-price menu, so our experience didn't directly reflect that of the casual visitor, but those items from the à la carte menu that we tried were all good. The deep-fried potato skins were crispy and flavoursome, with plenty of cheese and bacon. Roast dinner main courses were all tasty, and generously portioned. Kake visited on a Tuesday lunchtime in August 2013. A pint of lime and soda was £2.40. Prawn and crab sandwich (£7) photo was well-presented with a garnish of crisps and salad. The salad was nicely varied, including watercress and other leaves along with red onion, but the dressing was overly sharp and gloopy, the type you get out of a bottle. The sandwich itself was fine except that there was too much butter on it, masking the flavours of the prawn and crab. elvum's verdict: The food is above the local pub average. Deserves a second visit. Kake's verdict: Definitely a food-led place, and I don't think it'd be my pub of choice if I just wanted a drink. I'd come back for lunch though, if I was in the area. Accessibility: A small step to get in. Step-free to toilets once you're in. The cubicles in the ladies' at least are quite small. Step-free to patio from road directly next to pub entrance. Last edited 2013-08-22 13:37:19 (version 4; diff). List all versions. Page last edited 2013-08-22 13:37:19 (version 4).